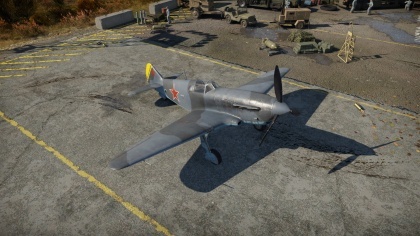 The LaGG-3-66 is a Rank II Soviet fighter with a battle rating of 3.0 (AB) and 2.7 (RB/SB). It was introduced in Update 1.31. The LaGG-3-66 is a jack of all trades type of fighter aircraft. Its key strength and weakness it does not have many weaknesses but does not have many advantages. 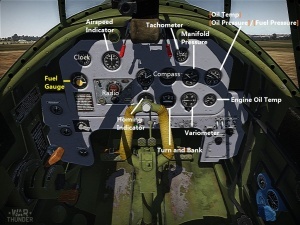 When flying the LaGG-3-66, it can be used in a variety of roles depending on what you are engaging in combat. Always keep in mind certain planes you battle may be better than the LaGG-3-66 at something. The LaGG-3-66 compared to the other LaGG-3 series offers a little more performance but trades it with a higher BR. This plane is a "jack of all trades, master of none" type of aircraft. When the LaGG-3-66 gets up-tiered, it will face opponents in far superior planes that will out perform the LaGG-3-66 with no issues. Therefore, when flying the LaGG-3-66 in up-tiered matches, keep your energy high and always force the enemy to fight on your terms (basically on your advantage but at the same time his disadvantage). Bomber Hunter: The LaGG-3-66 is a capable bomber hunter especially when using the rockets. Bombers that you would meet will easily disintegrate from a single rocket hit majority of the time or be crippled so badly that they will eventually crash. Also the Cannon and Machine gun on the plane can do damage to enemy bombers as well, it will take some time but eventually the enemy bomber will go down. Air Superiority: The LaGG-3-66 is a capable air superiority fighter as it can fight as a energy or turn fighter depending on what you face. But no matter what happens, you must keep your energy up always. There is a high chance in the LaGG-3-66 to face planes that can out perform this plane with no issues except in low speed maneuvers. Supermarine Spitfires: The Supermarine Spitfire is a plane to be feared when flying the LaGG-3-66 as many of the key strengths the LaGG-3-66 has, the Spitfire has (if not better). When battling the spitfire, always try to go for the initial hit as early spitfires (Spitfire Mk1/Mk IIa) do not react well to damage. If you are battling cannon armed spitfires, always go for the initial hit but remember the Cannon armed spitfire has far superior firepower compared to the LaGG-3-66 and will have no issues destroying the LaGG-3-66. Always remember do not get into maneuvering fights with Spitfires as they will easily out maneuver the LaGG-3-66 at any speeds. Nakajima Ki-43 Hayabusa and Mitsubishi A6M Reisen: When battling these planes, altitude is everything. These two Japanese planes will have no issue out performing a LaGG-3-66 in maneuverability. Therefore when facing these two enemy planes, use Boom and Zoom tactics to defeat them. The Ki-43 and the A6M is one of the few planes that the LaGG-3-66 will face that can easily defeat the LaGG-3-66 at low speed maneuvering air to air combat. Vought F4U Corsair and Grumman F6F Hellcat: The Corsair and the Hellcat should be feared as its firepower (compared to the LaGG-3-66's firepower) and superior speed will be a major factor to watch out for. Do not try to out run or go for head on attacks if possible when confronting the F4U Corsair or the F6F Hellcat. Turn fighting is your best chance of success as the LaGG-3-66 will have no issue out turning them. Macchi C.205: This plane is another key enemy of the LaGG-3-66. The Macchi C.205 is a capable enemy that can out perform the LaGG-3-66 in every category except at low speeds. When facing the Macchi C.205 try to force low speed turn fighting, eventually the advantage will fall to the LaGG-3-66. To counter the LaGG-3-66 is going to become a case of what your plane's advantage would be. The LaGG-3-66 does not have many weaknesses nor does it have any advantages. Therefore to shoot down the LaGG-3-66 is going to come down to what your plane's advantage is over the LaGG-3-66. 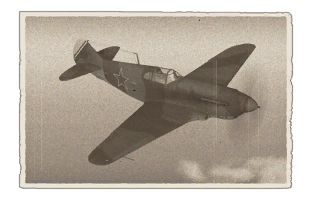 If you are in a plane that has a higher BR than the LaGG-3-66, more than likely your plane's advantages will easily out match the LaGG-3-66's advantages except in low speed fights. Primary upgrade targets are Compressor and Engine to improve the dogfight performance. Offensive 12.7 mm and Offensive 20 mm belts are next in the priority list. The other upgrade can be chosen at ones own needs, but the additional payload modules are cheap to get as tier 1 and 2 and can be good stepping stones to unlock the next tier. Rockets can be used for air to air combat. Best performance at low altitude (< 3000 m). Thick bulletproof glass to protect the pilot in head on attacks. Control surface compression at high speeds. Poor performance at high altitude. When up tiered this plane faces opponents that easily out perform this plane. This page was last edited on 9 January 2019, at 14:32.